Whatever the hell FCA is up to, we like it a lot. Something suspicious is going on over at Dodge lately. Specifically in its performance division, and it may be because FCA finds itself in the middle of an awkward situation with the Challenger. It’s been through a major refresh once but already the muscle car is becoming a classic, boasting a ripe nine years of life and turning ten next year. In terms of average industry length, that’s a pushing it. However, thanks to new special edition models, it keeps having its lease on life renewed. Most recently Dodge stunned the world by dropping the Challenger SRT Demon, a drag strip monster that’ll ensure the Tesla Model S P100D has to work hard to keep up on the quarter mile. However, Dodge isn't done yet. Autocar has just spied a very special Challenger testing on the streets. What’s curious about it is that this Challenger seems to have all the drivetrain hardware as the Demon but lacks the widebody kit. The most obvious exterior giveaway comes from the large Air Grabber hood scoop that can be seen on the hood and mistaken by just about zero self-respecting enthusiasts. A peep inside the cabin reveals an infotainment screen tuned to the performance adjustments section. It looks to be the same as the one featured in the Demon, with the horsepower readout declaring a staunch 808 ponies, exactly what the Demon makes when running on pump gas. Alone, these two indicators are strong signals that Dodge is thinking of installing the Demon’s 6.2-liter supercharged V8 powertrain into a slower (in a straight line that is) albeit more fun Challenger, especially when considering it wears the Hellcat’s hoonable 275/40ZR20 Pirelli P Zeros. 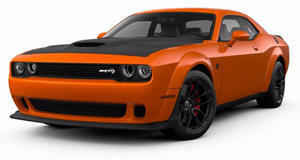 The images come just days after it was uncovered that FCA filed a patent for the name “Angel,” which could turn out to be a fun alternative to the Demon and a perfect bow-out for this fourth generation of Challenger. Our imaginations are running wild with speculation on what the name and powertrain could mean, but for now we’re happy Dodge decided to stick that hellacious engine into a more attractive package.